Forecasters say Sandy is no longer a hurricane but is still a dangerous system taking dead aim at New Jersey and Delaware. The National Hurricane Center said Monday evening that Sandy is a post-tropical storm and losing strength but still has sustained winds at 85 mph. The eye has almost made landfall. The center says storm surge has reached heights of 12.4 feet at Kings Point, N.Y. Gaining speed and power through the day, the storm knocked out electricity to more than 1.5 million people and figured to upend life for tens of millions more. It clobbered the boarded-up big cities of the Northeast corridor, from Washington and Baltimore to Philadelphia, New York and Boston, with stinging rain and gusts of more than 85 mph. Flooding will be a huge threat, with many areas potentially seeing rainfall amounts between 5 and 8 inches over a 48-hour period. The full moon will make storm surges worse, as high tides along the Eastern Seaboard will rise about 20 percent higher than normal. Correspondent Chip Reid reports from Ocean City, Md., that sea levels could rise 8 feet above normal - enough to flood much of the city. In addition to rains and flooding, about 2 to 3 feet of snow is forecast for mountainous parts of West Virginia. The tempest could endanger up to 50 million people for days. "This is the worst-case scenario," said Louis Uccellini, environmental prediction chief for the National Oceanic and Atmospheric Administration. President Barack Obama delivered a sober warning to millions in the path of the storm on Monday, appealing to those who have not evacuated to do so. "Please listen to what your state and local officials are saying. When they tell you to evacuate, you need to evacuate. Don't delay, don't pause, don't question the instructions that are being given, because this is a powerful storm." From Washington to Boston, big cities and small towns were buttoned up against the onslaught of Sandy, with forecasters warning that the New York area could get the worst of it -- an 11-foot wall of water. "There's a lot of people that are going to be under the impacts of this," Federal Emergency Management Administrator Craig Fugate said on "CBS This Morning" Monday. "You know, we've got blizzard warnings as far west as West Virginia, Appalachian Mountains, but I think the biggest concern right now are the people in the evacuation areas. They're going to face the most immediate threats with the storm surge." "The biggest challenge is going to be not knowing exactly where the heaviest-hit areas are going to be," said Fugate, "and the fact the storm's going to take several days to move through the area with heavy rain and wind, so that's going to slow down recovery activities like utility crews getting out and putting power back up." Off North Carolina, a replica of the 18th-century sailing ship HMS Bounty that was built for the 1962 Marlon Brando movie "Mutiny on the Bounty" went down in the storm, and 14 crew members were rescued by helicopter from rubber lifeboats bobbing in 18-foot seas. The Coast Guard said it found one of the missing crew members but she is unresponsive. The Coast Guard is still searching for the captain. Forecasters said the hurricane could blow ashore Monday night along the New Jersey coast, then cut across into Pennsylvania and travel up through New York State on Wednesday. As the storm closed in, a crane dangled precariously in the windoff a 65-story luxury building in New York City, and the streets were cleared as a precaution. Forecasters said the combination of Sandy with the storm from the west and the cold air from the Arctic could bring close to a foot of rain in places, a potentially lethal storm surge of 4 to 11 feet across much of the region, and punishing winds that could cause widespread power outages that last for days. The storm could also dump up to 2 feet of snow in Kentucky, North Carolina and West Virginia. Airlines canceled more than 7,200 flights and Amtrak began suspending train service across the Northeast. New York, Philadelphia, Washington and Baltimore moved to shut down their subways, buses and trains. More than 5 million riders a day depend on the transit system. New York, Boston and other cities called off school Monday. And all non-essential government offices closed in the nation's capital. Officials also postponed Monday's reopening of the Statue of Liberty, which had been closed for a year for $30 million in renovations. The United Nations said it would close Monday and canceled all meetings at its headquarters. And Broadway theaters were going dark. The New York Stock Exchange said it will be shut down Monday, including electronic trading. Nasdaq is shutting the Nasdaq Stock Market and other U.S. exchanges and markets it owns, although its exchanges outside the U.S. will operate as scheduled. In Washington, President Obama promised the government would "respond big and respond fast" after the storm hits. He also pleaded for neighborliness: "In times like this, one of the things that Americans do is we pull together and we help out one another. And so, there may be elderly populations in your area. Check on your neighbor, check on your friend. Make sure that they are prepared. If we do, then we're going to get through this storm just fine." On Monday afternoon Mr. Obama said he had spoken with the governors of all states likely to be affected, and added there had been "extraordinarily close coordination" among various levels of government. He said that even though food, water and generators have been moved into position, "this is going to be a difficult storm" with long-term power and transportation outages possible." He stressed repeatedly the dangers posed by the slow-moving storm, and said its effects - including power outages - would not dissipate quickly. Obama on Hurricane Sandy: "We're ready"
However, CBS News correspondent Chip Reid reports, some, like Ocean City, Md., surfer Brian Dean, said they have decided to stay. 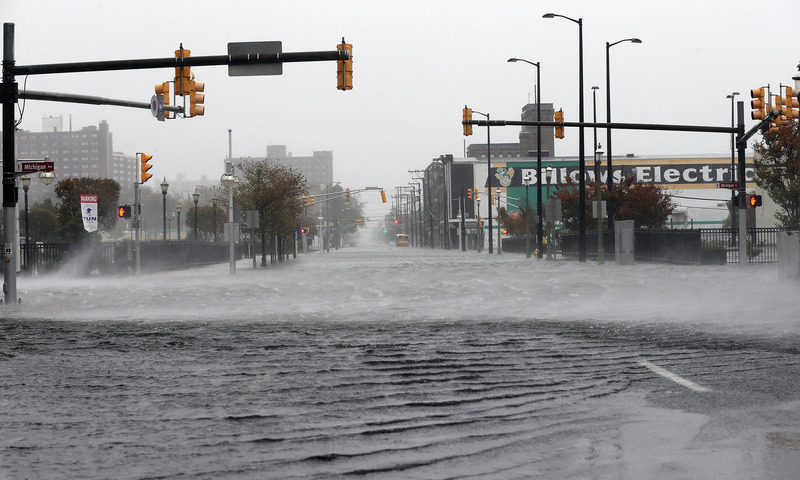 By mid-morning Monday CBS Station WCBS reports the ocean has breached the main oceanfront drive, Ocean Avenue, in Cape May, N.J., and streets in Atlantic City are rapidly flooding around the Boardwalk area. Sandy was blamed for 65 deaths in the Caribbean before it began traveling northward, parallel to the Eastern Seaboard. Despite the dire warnings, still others were refusing to budge. Jonas Clark of Manchester Township, N.J. -- right in the area where Sandy was projected to come ashore -- stood outside a convenience store, calmly sipping a coffee and wondering why people were working themselves "into a tizzy." "I'm real overwhelmed," she said as baby Zahiriah, wrapped in a pink blanket with embroidered elephants, slept in a car seat. "We're at it again. Last year we had to do it. This year we have to do it. And you have to be around all sorts of people -- strangers. It's a bit much."